Home › Uncategorized › Step by Step handbook for Agile Development. Part 2, the Steps in the Process. I want to caveat this entry with the statement that this is my version of the Agile process, in general it adheres to what I think of as the core values of pure Agile with SCRUM but over the years I have had to modify it to better fit the realities of the companies and teams I have worked with. 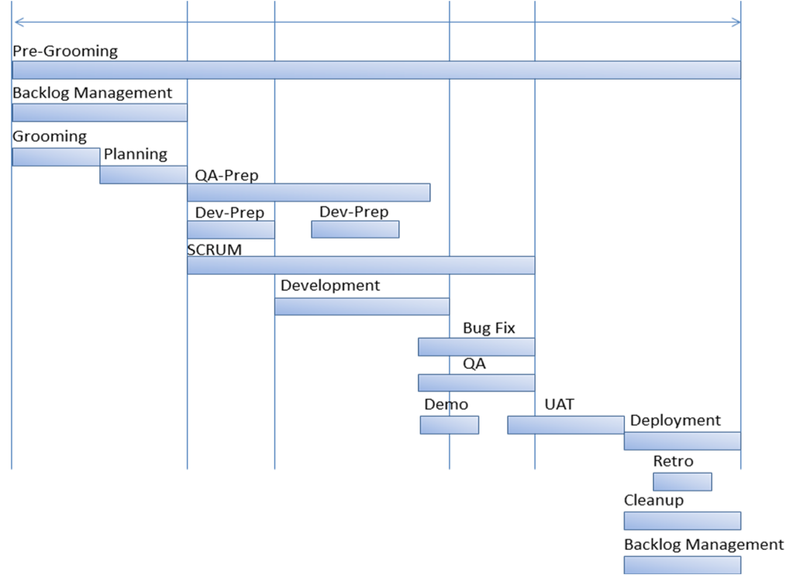 So in this entry I’ll quickly summarize what the each of the steps in the Agile process are and how I see each of them relate in terms of timing and sequencing. As I have stated before in this blog, I am going to assume that the reader already has a general knowledge of what agile is and what the basic terms mean so I won’t have to define every word. So how does all of this fit in in terms of timing? I’ve added a timeline chart to illustrate the relative timing and duration of each of the steps above. You will note that I do not tell you the duration of each of these steps. The reason I do that is that I don’t want the reader focusing on how long anything to supposed to take. At this point in the conversation it is more important to understand what each of the steps is and how they all fit in together. In a later post I’ll go into more detail on timing but for now I’ll leave you with this timeline. Next time in Part 3 we will begin with the detailed analysis of each of these steps. So for now just stick with me and please drop me a line if you have any questions, and thanks for reading.